Please note that depending on stock levels, this item may occasionally be shipped from outside the UK. Although this may mean a slightly longer delivery time, there will be no extra cost to the customer. Introducing the fantastic Firefly 2 Vaporizer, in a choice of 6 great colours, including the latest Jet Black (all black)! Be the envy of your friends with this simply stunning device! I am an authorised and fully insured seller and I ONLY EVER sell authentic branded items. 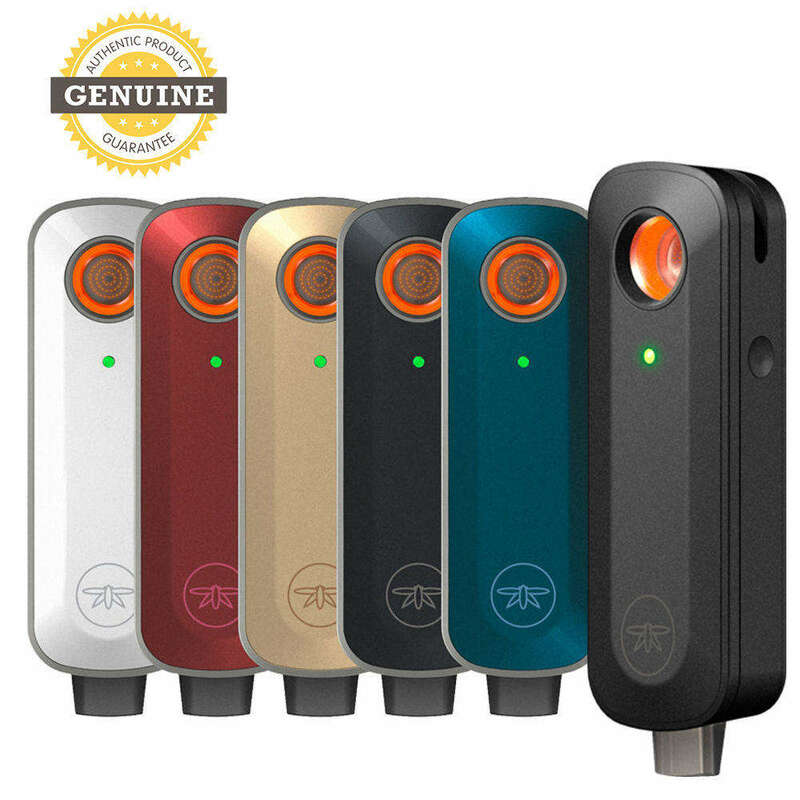 Please do not be tempted by suspiciously low prices, as any warranty will be invalid (this genuine Firefly 2 comes with a 2 year manufacturer's warranty) and clone copies of this device could be extremely dangerous! Firefly 2 vaporizes dry herbs and concentrates, heats in seconds, and delivers consistently superb vapour quality. It is so cool a device, that it has its own phone app, for Android or iPhone, that lets you control the temperature and customise the touch sensor. You can fully tailor it to your needs! It gives great, cool vapour flavour, looks absolutely stunning and has its own charging cradle, which will fully charge in 45 minutes. Please not that it is not suitable for e-liquids. Critics agree: Gizmodo names it the "Best Overall Vaporizer." The Portland Mercury says it's the "Best Portable Vaporizer in the Market." And Newsweek calls it the "iPhone of Vaporizers." Whether you are new to vaping or a long-time user, you'll appreciate the portability, (55% lighter and 33% smaller than Firefly 1), customisable temperature settings, efficient fast-charge battery and the simplicity and attractiveness of the design. The Firefly 2 has 6 temperature settings controlled by both your app and you can control the heat by touching the sensors on the sides of the unit. It has the ability to reach 205°C / 400°F in just 3 seconds! The Firefly 2 is less then half the weight and two thirds the size of the original Firefly making the new Firefly 2 a real contender for the best vaporizer in 2017. Reach 205°C / 400°F in just 3 seconds! Similar to the Firefly 1, you can control the heat by touching the sensors. The longer you touch or hold the sensors the hotter the temperature goes. It’s kinda tricky but once you’re used to it it’s a nifty little feature to get the most out of your material. Alternatively with this version you can use the App and have the choice between 8 pre-set temperature settings. This is called manual control. One advantage to the manual control is that you can set it to 420°f or 215°c for concentrates. Just remember to lower the heating though when changing back to dried material as you’ll cause combustion at 215°. The new battery and charging cradle means the Firefly 2 is ready and fully charged in under 40 minutes. The cradle comes with a USB 3.0 that can connect to any cellphone or tablet charger or USB plug adapter. The Firefly 2 Vape battery can be swapped in and out very easily, it can be pulled out and replaced at will. The Firefly vape can also be charged with an external charger which saves a lot of hassle when you are out and about Vaping. The Firefly 2 Vape comes with two batteries so you can always have a spare one charged and the other in your device, never be caught without your vape ever again! Each battery can last for roughly 40-80 draws which provides ample time for a good session regardless of your previous Vaping experience (This all depends on your preferred heat settings). A magnetic lid and borosilicate glass vapour path ensures loading & cleaning is very easy. The mouthpiece can also be removed & has a particulate filter which can be removed and replaced also. The Firefly’s unique dynamic convection technology only heats your material as you inhale, allowing you to enjoy the flavours & experience all the active ingredients at the same time they are released. You have to pay for quality. I am an authorised and fully insured seller and I ONLY EVER sell authentic branded items. Please do not be tempted by suspiciously low prices, as clone copies of this device could be extremely dangerous! It can be difficult to develop the correct draw technique if you are unused to vaping herbs. If you are concerned about this, it may be better to choose a different model. If you contact me before buying, I can advise on this. If you’re not 100 percent satisfied with your purchase, you can return your order for a FULL refund or exchange. All goods must be returned (at buyers cost) in their original packaging. You must authorise the return with us first within 30 days from the day you receive your order. You may open the packages and inspect them and switch on items to ensure they operate correctly, but we are unable to refund any product to which herbs, concentrates or liquids have been added, unless the item is faulty.